There have been many, many boxing movies, but very few wrestling movies. As in Olympic wrestling, not WWE, brother. Foxcatcher dramatizes the true life story of Mark Schultz, his association with millionaire heir John du Pont and his run for gold in the 1988 Seoul Olympics. It's type of story that is so strange, it can only be based in fact. Mark, slumming since he achieved glory in the 1984 Los Angles Olympics, is plucked from post-Olympic obscurity by John du Pont for funding to train for more matches. Their interactions become more bizarre, and strained, as the film progresses. Mark, frustrated, hopes to create a life outside the shadow of his older brother, Dave, Davy Schultz is also an Olympic Medalist and the better wrestler of the two. A dinosaur in sports years, the relationship he has with du Pont may be the last chance Mark has to make it big. 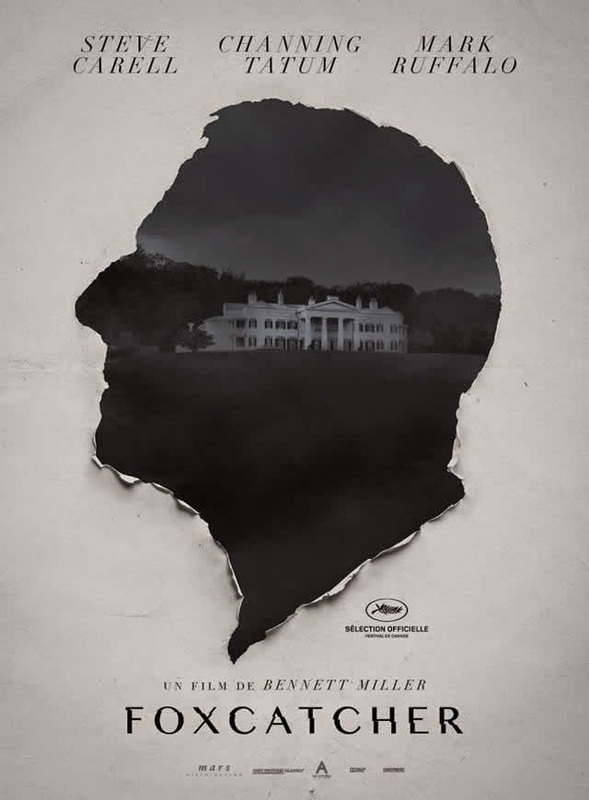 Foxcatcher largely an "actors" film giving the leads plenty of scenery on which to chew. Unfortunately, the film's three leads all engage in various gimmicks to "transform" themselves. Channing Tatum makes his lower jaw protrude and haunches for much of the film. Thanks to providence, he doesn't let his character's mannerisms get in the way of what is likely the most nuanced performance of his career. Mark Ruffalo, giving the best performance of the bunch, doesn't let his extra jowels and bald spot take the place of his portrayal of Dave. Ironically, the much ballyhoo'd performance by Steve Carell, however, doesn't fare as well. Unlike Tatum and Ruffalo, Carell gets a prominent fake nose, which is shot in profile as much as possible to maximize the effect. The only way it could have been more obvious that Carell is doing "serious acting" is if he wore a shirt that read, "Awards Plz." On their own gimmicks, whether makeup or weight changes, cannot carry a performance. Whether on purpose or a result of his gimmicks, Steve Carell's du Pont acts like an alien. Sometimes this helps the film, since du Pont is supposed to be a bizarre man, other times this act enters Saturday Night Live-style parody. The thing is, du Pont is such a character they did not need these gimmicks. Du Pont, to some extent, treats his wrestlers as a product, and investment, not unlike the horses bread for derby at the titular the Foxcatcher Ranch. The fake nose and put on voice don't help carry the story when du Pont attempts to separate and control the Schultz brothers. While Carell has clearly worked on the mannerisms of his character, which indicate the air of someone who is too wealthy to care about the daily concerns of plebeians, it does not add complexity to a person who has, shall we say, "mother issues." Surrounded by memorabilia of Revolutionary War, du Pont wants to lead his troops into battle at the Olympics. Too bad theses elements are only hinted at, letting the nose do all the talking. Foxcatcher has all the elements of a great film. A true life story, with larger than life characters and an underdog sports plot tying the elements together. Foxcatcher is a good film though, not a great one. Various choices by director Bennett Miller and his team undercut the core of the story, opting for gaudy flash over substance.